The NEW Encore 'MAX' Pickleball paddle (the Gen 2 version of the Encore GP) provides all the same characteristics of the legacy Encore. 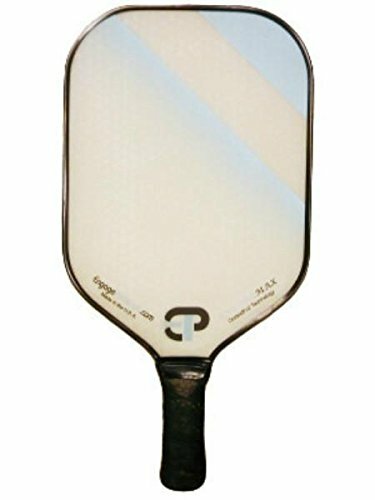 Maximum deflection (power), surface roughness (spin) and ball control, but with the largest 'Sweet Spot' and 'Paddle Face' of any paddle being produced on the market. The grip size was optimized to maximize the surface area while still being able to grip the paddle with your entire hand (while minimizing wind resistance). The weight is perfectly balanced so it feels very similar to the legacy Encore weight wise. An amazing paddle for 'dinking', 'blocking' and for any other shot. The Encore line of paddles have always been about 'control' and 'ball placement', and having the perfect paddle to do just that (what you want with the ball) whether you hit 'hard' or 'soft'. USAPA Listed and Approved for Sanctioned Tournament Play.